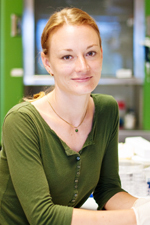 Home > Departments > Faculty > Néva Meyer Ph.D.
My research focuses on understanding how nervous systems evolved. Multiple groups of animals throughout the Bilateria possess centralized nervous systems – vertebrates have an anterior brain and dorsal nerve cord, whereas annelids (segmented worms) and arthropods (insects and crustaceans) have an anterior brain and a ventral nerve cord. However, the earliest branching animals (e.g., comb jellies and jellyfish) have non-centralized nervous systems, or nerve nets. This raises the question of how and when centralized nervous systems evolved. Most of the modern molecular descriptions of neurogenesis come from only two of the three major bilaterian clades, the deuterostomes (e.g., vertebrates) and the ecdysozoans (e.g., arthropods). There remains a huge gap in our knowledge of central nervous system development in the third bilaterian clade, the spiralians (e.g., annelids). By studying central nervous system development in annelids, I hope to make significant contributions to our understanding of the basic mechanisms of neurogenesis in annelids and to our understanding of the evolution of centralized nervous systems. One major goal of my research program is to elucidate the molecular and cellular mechanisms driving neural fate specification during brain and ventral nerve cord development in the spiralian annelid Capitella teleta. A key step during central nervous system development in arthropods and vertebrates is specifying the fate of neural precursor cells (NPCs), which generate the brain and nerve cord. The cellular mechanisms involved in internalizing NPCs from the outer ectodermal layer are different between vertebrates and arthropods, yet they both use similar genes (the proneural bHLH transcription factors achaete-scute and neurogenin) and signaling pathways (Notch/Delta) to specify NPC fate. My lab employs several approaches to characterize the cellular and molecular aspects driving NPC fate specification during central nervous system development in C. teleta. These include high resolution imaging, gene expression analysis, functional analysis, and bioinformatics approaches, which are facilitated by a sequenced (8x coverage) C.teleta genome. Preliminary results suggest that the cellular mechanisms of C. teleta brain neurogenesis are similar to those found in the development of the arthropod CNS. However, preliminary functional analyses of a proneural homolog in C. teleta (CapI-ash1) suggest a function that is more similar to proneural gene function during vertebrate neurogenesis. As a complement to developing functional studies in C. teleta, I also have mapped early blastomere fate (through 32 cells) by intracellular lineage analysis. These types of lineage analyses are possible because C. teleta, similar to many other spiralians, develops by a highly stereotypical cleavage program called spiral cleavage. This stereotypy allows homologous blastomeres to be recognized across taxa even though they generate diverse body plans, thus facilitating reconstruction of the evolution of structures within the Spiralia. In addition, by identifying which cells generate the brain and ventral nerve cord in C. teleta, I can introduce reagents into subsets of tissues and analyze the developmental consequences. This fall (2011), I am teaching Neurobiology (BIOL 141). BIOL 141 is an introduction to neurobiology and covers a broad range of topics including the mechanisms used by neurons to transmit information (e.g., action potentials and synaptic transmission) and to receive input from the environment (e.g., sensory systems). This course also discusses development, repair and regeneration of the nervous system and complex brain functions such as learning and memory. In the spring of 2012, I will teach Physiology (BIOL 240), which will be an introduction to the physical and chemical functions that maintain animal, including human, life. This course will compare physiological systems across multiple groups of animals. Jackson, D.J., N.P. Meyer, E.C. Seaver, K. Pang, C. McDougall, V.N. Moy, K. Gordon, B.M. Degnan, M.Q. Martindale, R.D. Burke, K.J. Peterson (2010). "Developmental expression of COE across the Metazoa supports a conserved role in neuronal cell-type specification and mesodermal development." Development, Genes and Evolution 220: 221-234. Layden, M.J., N.P. Meyer, K. Pang, E.C. Seaver, M.Q. Martindale (2010). "Expression and phylogenetic analysis of the zic gene family in the evolution and development of metazoans." EvoDevo 1: 12. Meyer, N.P. and E.C. Seaver (2010). "Cell lineage and fate map of the primary somatoblast in the polychaete annelid Capitella teleta." Integr Comp Biol 50(5): 756-767. Meyer, N.P., Boyle, M.J., Martindale, M.Q. and E.C. Seaver (2010). "A comprehensive fate map by intracellular injection of identified blastomeres in the marine polychaete Capitella teleta." EvoDevo 1: 8. Meyer, N.P. and E.C. Seaver (2009). "Neurogenesis in an annelid: characterization of brain neural precursors in the polychaete Capitella sp. I." Dev Biol 335(1): 237-52. Mizutani, C.-M., Meyer, N.P., Roelink, H. and E. Bier (2006). "Threshold dependent BMP mediated repression: a conserved mechanism for patterning the neuroectoderm." PLoS Biol 4(10): 1777-88. Meyer, N.P. and H. Roelink (2003). "The amino-terminal region of Gli3 antagonizes the Shh response and acts in dorsoventral fate specification in the developing spinal cord." Dev Biol 257(2): 343-55.